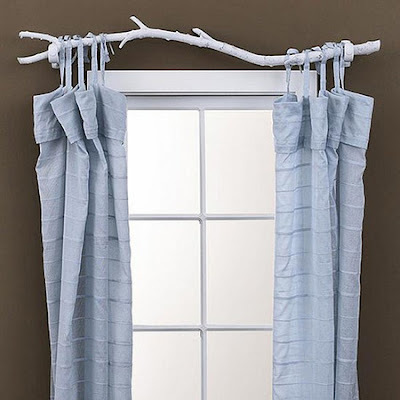 Today's design blog find comes from DIYideas.com who gives us the tree branch curtain rod. Not only is this a great way to put a modern twist on nature, but it's super cost effective: all you need is a tree branch and a can of spray paint! The instructions are simple: grab a tree branch slightly larger than your window. Cut the stems off until it has the look you want. Give it a quick coat of spray paint, then mount it with the same curtain rod holders you'd use for a normal rod. The one drawback is that you can't move the curtains around once you put them on the branch since they'll get caught on the stems. DIYideas.com recommends buying tie-top curtains which are easy to tie around the branch and then using tie backs to open and close the curtains as you wish.